This was a character created by Kevin & Mary Hendryx. They commissioned me to create this high-quality graphic for use on T-shirts. This was a very fun project, being as the client had a very specific feel in mind for the character. 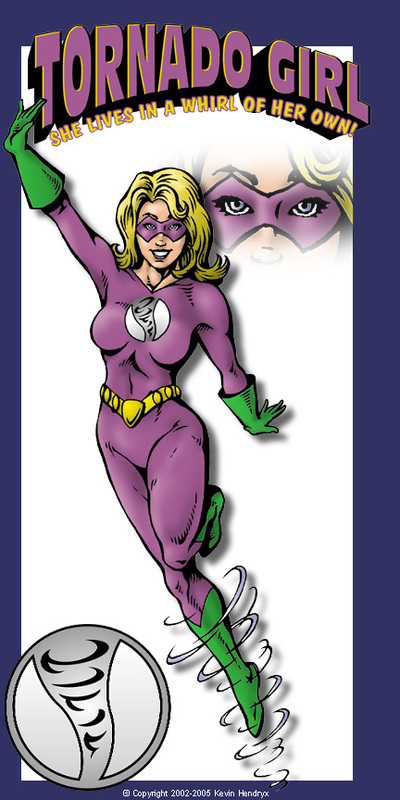 She was based on mid-70's DC Comic heroines, such as Black Canary and Wonder Woman, but with a slightly comical feel. They even mentioned specific comic artists whose style they were looking to emulate. The character, with her "masthead" (top) were used on the back of the shirt, while her insignia (bottom) was the shirt front. Check out the thumbnails of newer images of the character below (click the thumbnails to view them larger)! 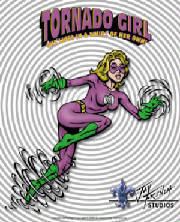 Click on her image to view their CafePress Store and all the Tornado Girl merchandise!